﻿ The Wildlife of Blashford Nature Reserve. This Wildlife haven just outside Ringwood, on the edge of the New Forest, is rapidly becoming one of the "must go to" Wildlife Hotspots on the South Coast. 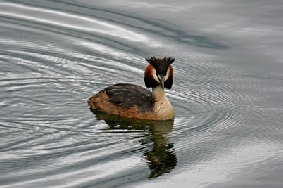 Offering a number of different habitats it is based around some former gravel workings which have been flooded and landscaped to provide a number of Wildlife rich Lakes and Ponds. Managed by the Hampshire Group of the Wildlife Trust it is proving to be a Wildlife site "up there" with the best the UK has to offer. Apart from the phenomenal diversity of species that make it their permanent home it is also proving to be an invaluable stop-off on various migration routes as well as an important over-wintering site for a great many species that visit our shores during this inclement period.